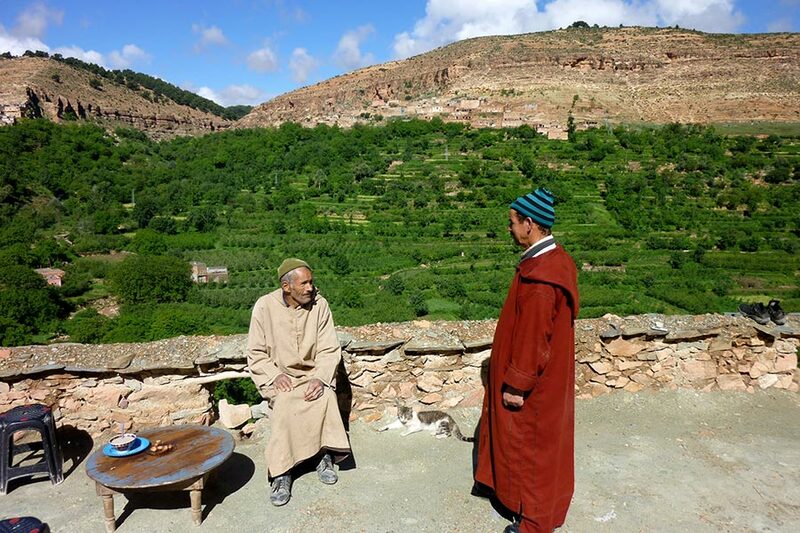 These excursions give you the chance to visit several different Berber villages and stay with many different families. 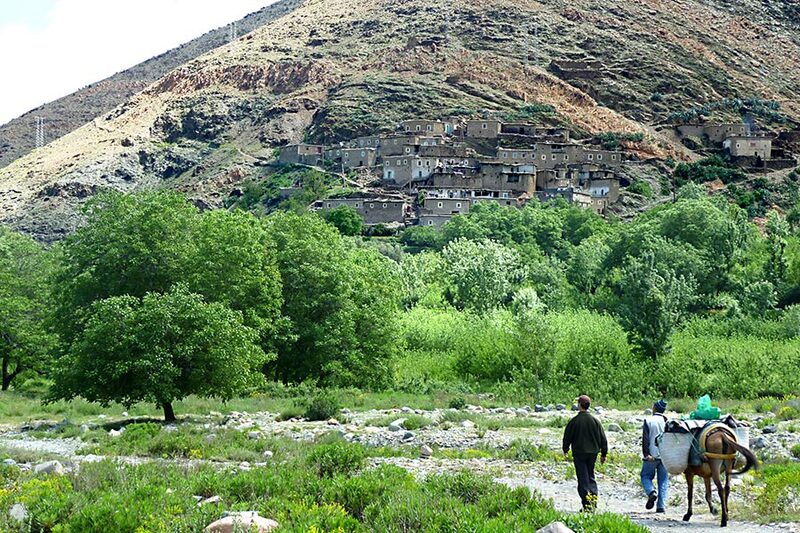 Escape the other tourists, and walk out to centuries-old villages to see rural Berber life up close. Berber Travel Adventures offers custom 3-5 day excursions for those who want to be immersed in Berber life and culture for an extended time. Every day includes many hours of walking—sometimes flat walking and sometimes on inclined trails. 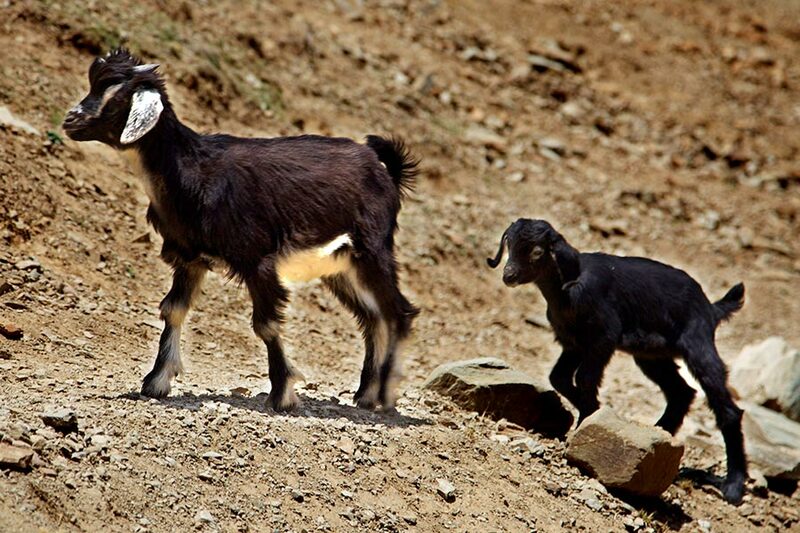 You're rewarded with an unforgettable view of Berber life in the High Atlas mountains. Those who have taken our three, four, or five day excursions have regularly commented that it was the highlight of their time in Morocco. Here is an example of a three day excursion. Let us know what you are looking for, and we can adjust our excursions to meet your fitness level and schedule. All of the villages listed below can be found on our villages map. 5:30 PM Head out to explore the village and possibly visit some other homes along the way. 9:30 AM We start our hike through a pine forest towards the village of Ait Ahmed/Igourdan. 1:30 PM Arrive at Igourdan and stop for lunch at a family home. 3:00 PM After lunch we continue our way towards Imintala through the villages of Infag, Anammer, and Imzayn, going by a well-known ancient mountain spring, a beautiful valley system with a panoramic view of the river-bed and its green fields to both sides. 5:00 PM Arrive at Imintala where we stay at a local Berber home, relaxing with a beautiful view of the area. We spend the night in Imintala. 9:30 AM Depart from Imintala, pleasant walk through many small villages and green fields of Ouainghd, Iminisli, Sllamt, Tizgui, and Ait Ouskri. 1:00 PM Arrive in Anmanar where we will have lunch with a local family. 3:00 PM More walking through the villages of Tamazirt and Takouit. 4:00 PM Arrive in Amizmiz, depart for Marrakech. 5:00 PM Back in Marrakech. Here is an example of a four day excursion. This excursion ends at a village with road access, giving us the opportunity to get transport back to Amizmiz. This allows us to trek a bit deeper into the High Atlas Mountains, since we do not need to circle back to Amizmiz by the final day. All of the villages listed below can be found on our villages map. 9:30 AM Set out walking for the day. We pass by the canyon and through the pine trees, going by the village of Tnirt. 1:00 PM Arrive in Anamrou where we will have lunch with a local family. 3:00 PM Depart from Anamrou and pass by several more villages. 5:00 PM Reach the village of Lmedinat and arrive at a Berber home for more cultural experiences and accommodation for the night. 9:30 AM Head up the valley to visit the mining area. 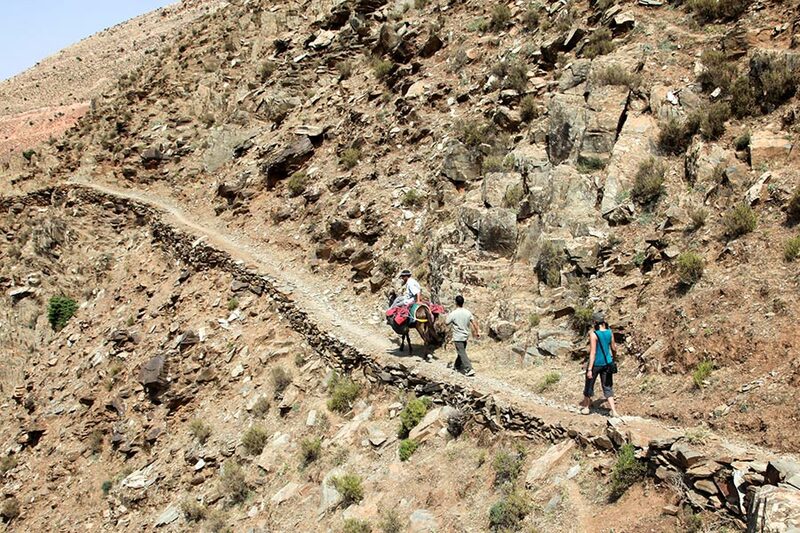 Enjoy the scenic view of Erdouz mountain, which is part of the High Atlas mountain range. We have a snack and on the way back, come through the village of Ait Dawd and then return to Lmedinat to eat lunch at the house. After, we head down to the village of Azgour. 4:00 PM We arrive at Azgour where we meet our transport, load baggage, and head back to Amizmiz in about a 30 minute drive. 4:45 PM Arrive in Amizmiz. Unload baggage and transfer to transport headed to Marrakech. 6:00 PM Arrive back in Marrakech. Here is an example of a full five day excursion. 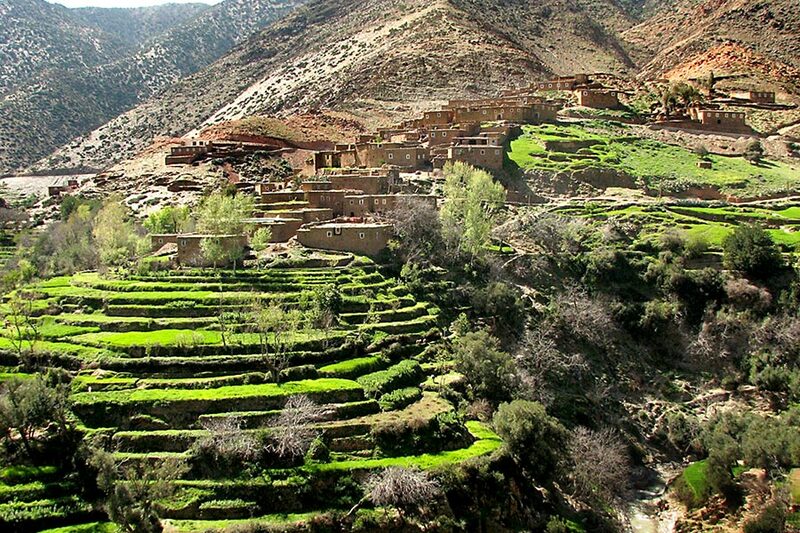 By the end of this excursion, you will have visited a great number of Berber homes for both lunch and dinner. You will have an excellent sense of daily Berber life and no doubt will have picked up a good number of Berber words and phrases. It will be a truly unforgettable experience. All of the villages listed below can be found on our villages map. Arrive at Amizmiz from Marrakech in the morning and set out towards the Anogal valley. We pass by the village of Ait Hamd and have lunch by the river facing the village of Igordan that’s on the top of the hill. After lunch, we carry on and get to Imzayn where we stay at a local Berber home, relaxing with a beautiful view from the rooftop. We spend the night in Imzayn. About 5 hours of inclined, but not steep, walking during the day. We set out walking in the morning, going by the spring at Imintala, a beautiful valley system with a panoramic view of the river-bed and its green fields to both sides. We pass by the canyon and through the pine forest where we have lunch beneath the trees. After lunch, we pass by several villages until we finally get to the village of Lmedinat and arrive at a Berber home for more cultural experiences and accommodation for the night. About 5 hours of walking during the day. 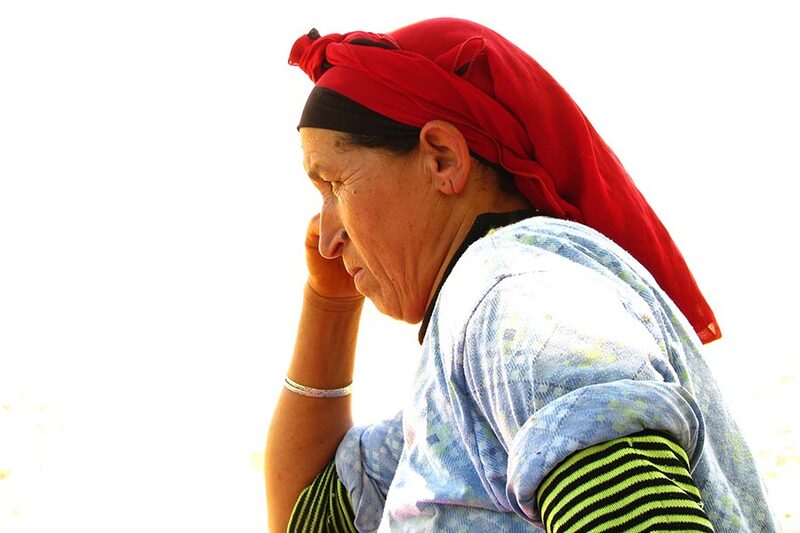 We go first up the valley to visit the village of Ait Dawd and have tea with a family there. We visit the mine area and come back to Lmedinat, eat lunch at the house then head down to the village of Azgour. 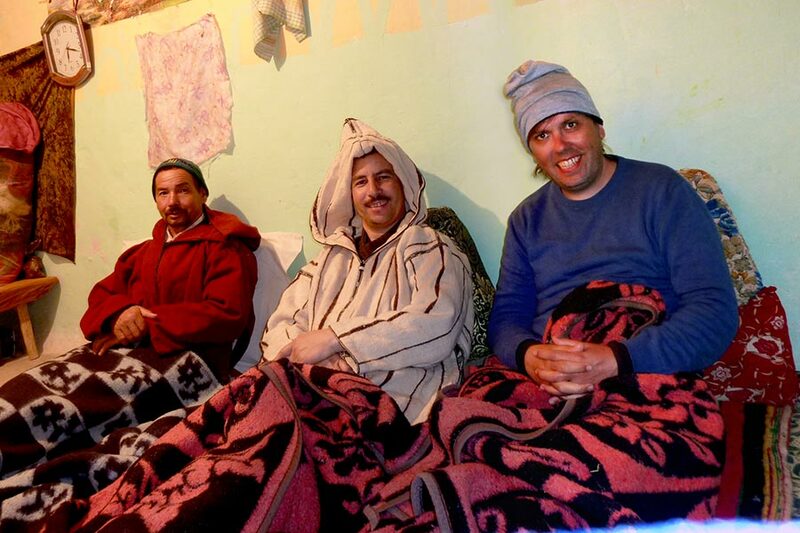 We arrive at Azgour and stay again with a Berber family for the night. About 3 hours of easy walking during the day. After setting out in the morning we have lunch at the trees in between villages. We head back to the valley that takes us to Tizgui. We arrive at the village of Tizgui for the night and stay with a local family there. About 5 hours of walking during the day, half of which is inclined and half is flat road. We head out for about 3 hours of mostly flat walking alongside the river-bed. Get to Amizmiz for lunch and then get transport back to Marrakech.